IT must have seemed like a bright idea at the time. 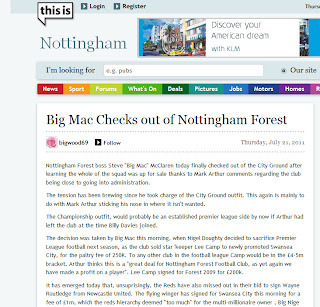 The Nottingham Post website has introduced a feature where readers can add their own news stories to the website. I suppose the idea was to generate extra content and, in turn, extra traffic. Well, I suspect it's getting the extra traffic now, but not in a good way. The website is being swiftly tweeted, judging by the tweets in my inbox, and the Sport section is the area with the most activity. 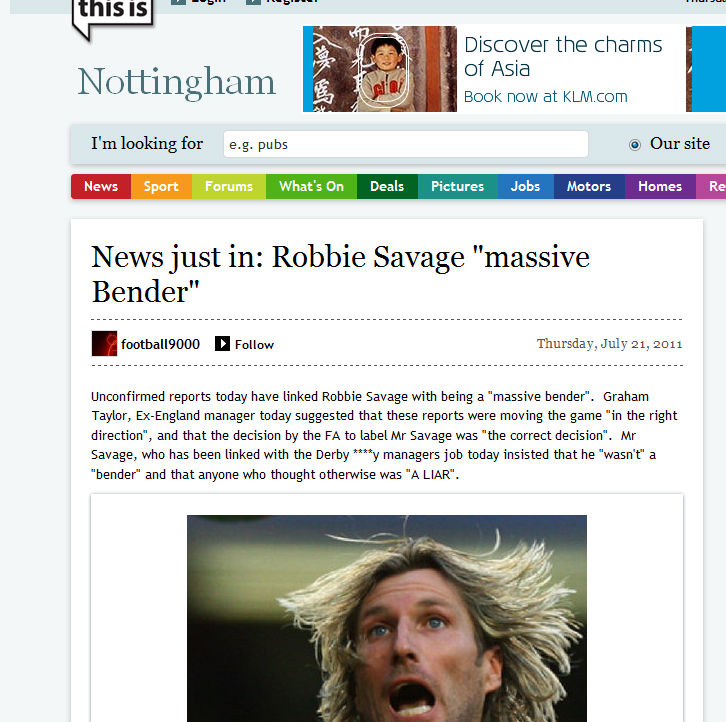 Wind-up merchant posters are filing stories on Nottingham Forest signing Baggio, Salomon Kalou and Carlos Tevez. One story has Steve McClaren quitting and the club going into administration. Some of these stories are being removed as they get spotted by Post staff, but I'd wager that you'll see an upsurge of silly stories again come 1am as rival football fans tumble home from the pub. A number of the comments from readers seem to be asking if the site has been hacked. Sorry, readers, this is a result of the not-so-carefully-considered plan. All of the stories are being filed directly onto the site, completely unedited. Nothing is checked. There is no hint of being able to prove what is written. If I was a libel lawyer, I'd bookmark the site right now, and possibly give Robbie Savage a quick call about the story pictured above and ask him if he'd like me to send a letter to the Post. Over on the news page, there's a story masquerading as news that is nothing more than a plug for a local kitchens business. I'm sure others will follow. The only indication as to whether it is a user-generated story or not seems to be in the byline. 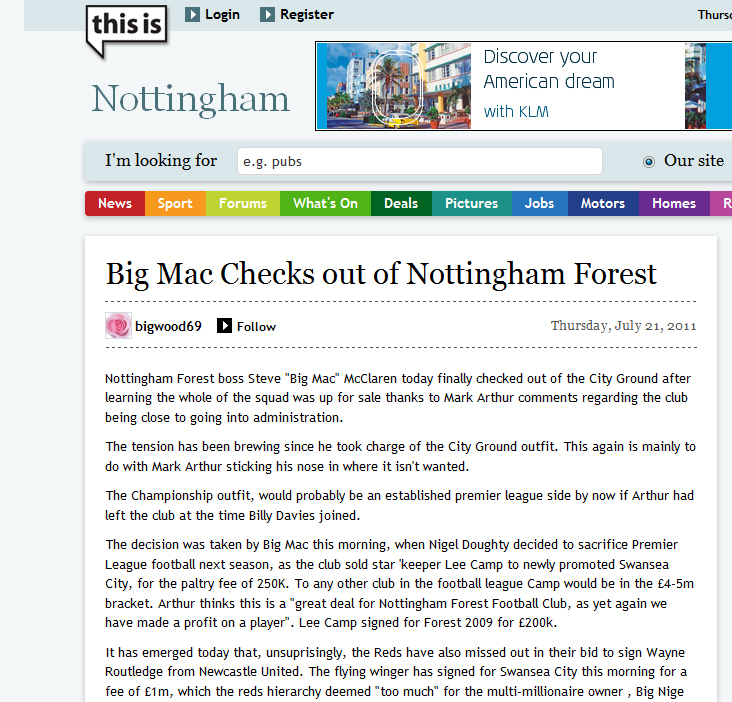 If it reads Nottingham Post, it's official. If it's a person's name, it's phony. Which seems to suggest that none of the reporting staff there will be getting any website bylines in a hurry. Looks like their experiment has trundled to a very quick end, with the editors inserted back in the way of the eejit threads. Nothing wrong with readers turning contributors, I've had many many very fine reader correspondents filing items of news over the years, but they've been carefully chosen, and all their work has been edited.